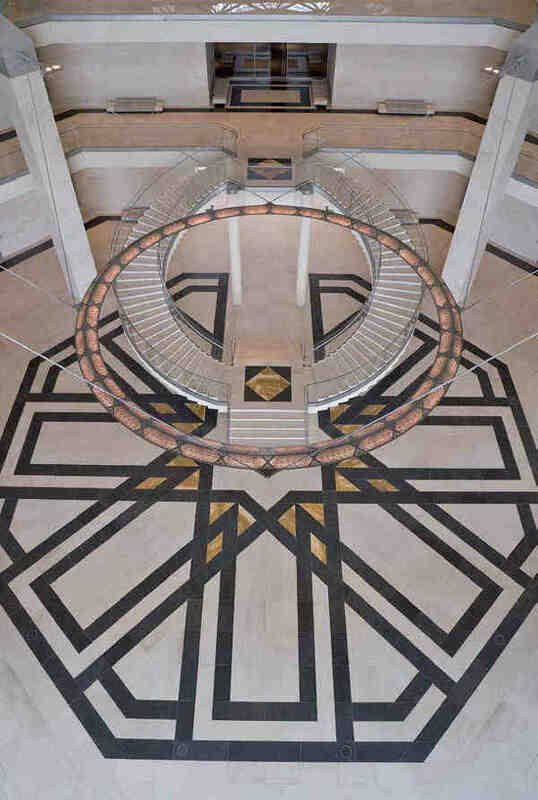 The grand spiral staircase at the centre of the atrium of the Museum of Islamic Art. Amid the murmurs of appreciation and click of well-heeled shoes at the private opening of Qatar’s new museum of Islamic art, came the occasional soft thud of a forehead against a glass cabinet. Like most other materials used in the museum’s interior galleries — designed by renowned French museocologist Jean-Michel Wilmotte — the five thousand square meters of glass was of a particular, reassuringly expensive, quality, uniquely non-reflective and polished to a high degree of transparency. Viewed from Doha’s Corniche, I. M. Pei’s “last building” — the ninety-one-year-old architect was brought out of retirement to design the museum — is almost modest in scale, though no less majestic for that. Built on its own manmade island, the building is accessed down an avenue of palms or by dhow across the harbor. 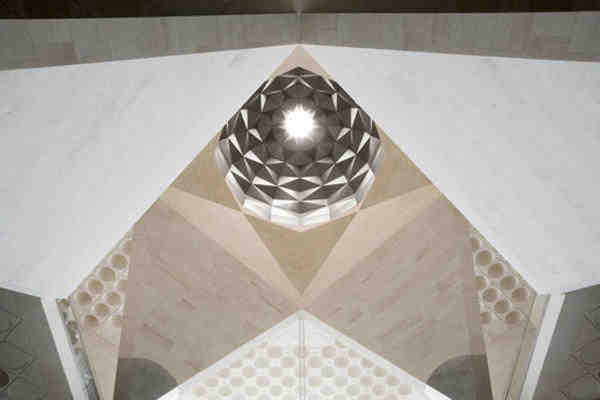 In preparation for the project, Pei reportedly embarked on a six-month period of study across the Middle East and beyond, and his design nods as much to Cairo’s ninth-century Ibn Tulun Mosque as it does to his own Louvre extension. A serene monument amid the clamor of Gulf capitals, it is perhaps the most architecturally significant public building in the area to date. The dome of the Museum of Islamic Art. On the museum’s first floor, the galleries were organized according to artistic tradition (calligraphy, the figure, and so on), while the floor above was chronological. A central first-floor gallery provided an overview of sorts and included a collection of prized objects dating from the ninth century to the Ottoman empire of the eighteenth, displayed against the museum’s “Wilmotte gray” walls, or in glass cabinets dramatically lit. An exquisite ninth-century earthenware bowl from Iraq, probably from Basra, included a perfectly poised calligraphic inscription in cobalt blue; a Leila and Majnoon embroidery had silver-wrapped silk thread on silk velvet from 1570s Iran; a page from a tenth-century North African Qur’an, in gold ink on deep blue parchment, was surprisingly undimmed by time. 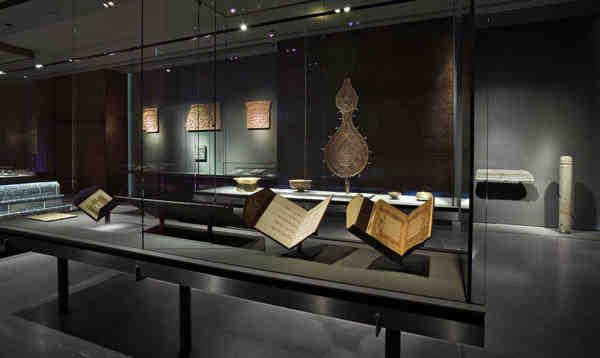 Gallery view of the “Writing in Art” section of the Museum of Islamic Art’s permanent collection. The galleries were deeply reverent, and the objects — including small jewels such as the seventeenth-century jade amulet Shah Jahan wore to commemorate his wife Mumtaz — were monumentalized by the dark rooms and strategic lighting. An interiors specialist listed the building materials as though reading the specials of the day in a five-star restaurant: metalized and stained Louro Faya Brazilian lacewood; dark grey Argentinian porphyry stone, polished for the floors and striated and bush-hammered for sections of the walls. Audio guides offered some description, but the galleries themselves were otherwise almost devoid of information, and objects were displayed in a highly contemporary fashion, with minimal labels. A collection of astrolabes, for example, was stunningly exhibited along glass shelves, as though it were an installation, aestheticizing the ancient astronomical brass instruments. For the informed viewer, the exhibits may have boasted their own particular logic. But in general, objects were imbued with power and meaning more through the aesthetics of display than for their place in history, which set up an interesting relationship between ancient and contemporary art in the region. And while that didn’t seem to be the MIA’s goal, per se, a potential dialogue does lie in Qatar’s future network of museums and an impressive state collection that takes in Richter, Bacon, and Hirst as well as Moshiri and Hefuna. In addition to the MIA, Qatar is in the midst of planning for a National Museum designed by Jean Nouvel, a Museum of Modern Arab Art, and a Heritage Library to house its collections. 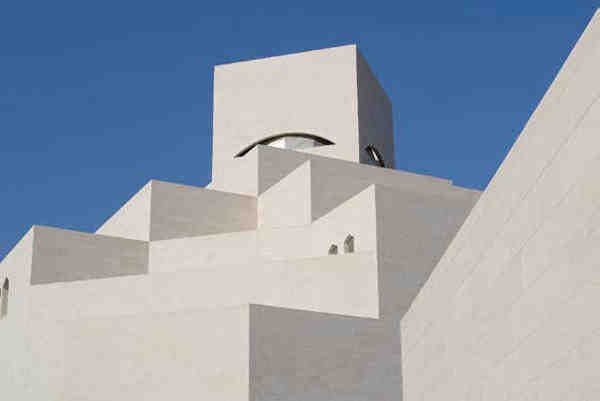 Outside view of the Museum of Islamic Art, Doha. With the opening of the MIA, Qatar may have beaten its neighboring Gulf States in the museum–building race underway — although in the current economic climate, it’s perhaps only Abu Dhabi that is now a truly active competitor. (Rumors abound that even its clutch of arts-institutions-to-be, including Guggenheim and Louvre outposts, a Zaha Hadid–designed Performing Arts Center, and a Maritime Museum by Jean Nouvel, are on “go slow,” particularly the latter two.) Perhaps the MIA is the last pre-credit-crunch jewel box. All of these activities beg an obvious question: why are the Gulf States so keen to build grand monuments to the arts in the first place? In addition to the obvious Bilbao-inspired brand-building potential of a museum, and cities’ associated desires to situate themselves “on the global cultural map,” there does appear to be a genuine desire in some corners to provide educational opportunities for local young people; the development of museums seems to go hand-in-hand with the accompanying opening of universities in the region, from Virginia Commonwealth University and Carnegie Mellon in Doha, to NYU and the Sorbonne in Abu Dhabi. And of course there is the possibility of “building bridges” — a hackneyed concept tacked on to nearly every cultural initiative in the Gulf. Well, why not build bridges through art? At one point in the MIA’s opening tour, museum director Dr. Oliver Watson went out of his way to point out a set of wooden doors from Cairo with ivory inlays: one featuring Coptic crosses, another, Islamic inscriptions. Just as the aesthetics of a gallery’s design have the potential to connect artifacts with contemporary works, such moments in the tour provided food for thought and the vague yet fascinating possibility of “reclaiming” Islamic history and, through it, the Islamic present.